This is the last of my scheduled posts whilst I was away on a South Pacific cruise. Its been a hard slog writing up all these posts in one day before I left. 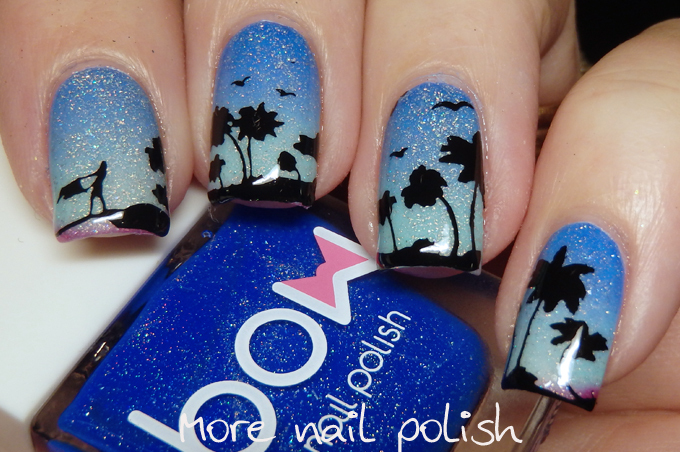 I really like that the theme for this weeks 40 Great Nail Art ideas is Holiday, seaside or beach themed nails, because that's exactly what I've been doing. I told you last post how much I loved the Bow polish thermal top coats. Here is the second mani I've created with them. I started with a soft gradient base using Picture Polish Freya's Cats and Salt Water. I sponged on more salt water over the top to make sure the gradient wasn't too dark. 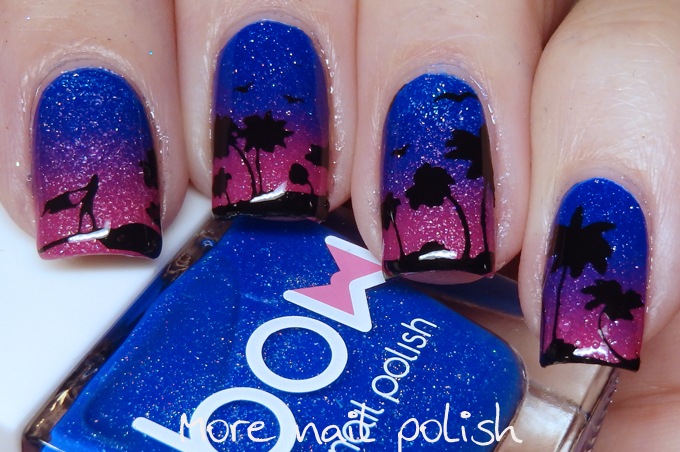 This gradient created the 'daytime' version of my mani. Next I layered another gradient over that using the Bow thermals. 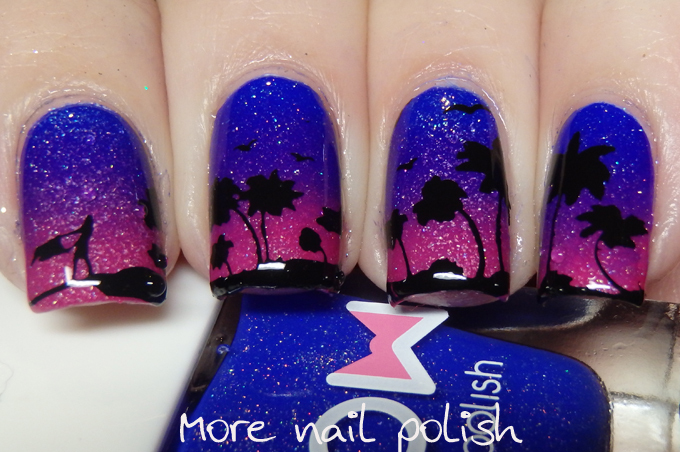 I used the blue, purple and pink shades to create a 'night time sunset' version. When my nails were warm, the thermal top coats disappeared to show the light blue sky gradient, then they were cold, they showed the night time sunset. So much fun!! 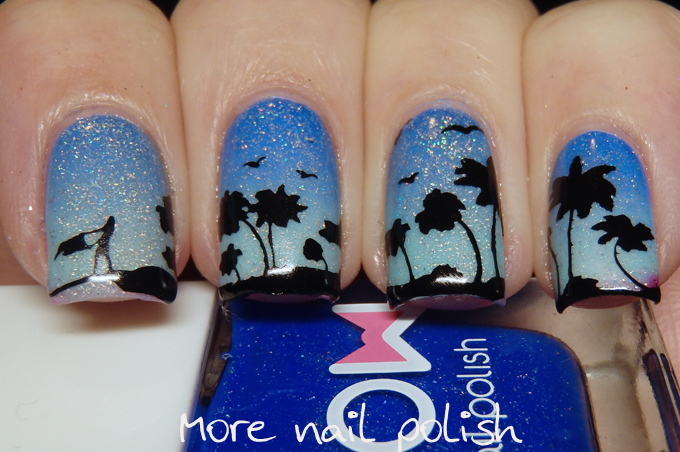 The stamping is from the DRK XL Seasons plate, and whilst I love this page and the images on it, I was a little disappointed with the details on the palm trees, some of the smaller ones just look like blobs rather than having nice detailed fronds. The plate quality is great, just look at those fine detailed birds, so I just think it's the actual tree design that isn't great. Jump on over to instagram later to see a transition video. I like your nails, where did you get this design? I always do manicure or paint my nails in different colors. I have LED lamp at home, so it is easy for me to make fast design. I always try something new, thanks to http://nailartstyle.com where are a lot of different options.